Al Pastor, a Mexican dish of pork marinaded in pinapple juice, dried chilis, vinegar, and various spices, is one of my favorite things in the world. I judge every Mexican restaurant I go to by the quality of their Al Pastor. It's seriously the best thing ever. Most Mexican restaurants in the U.S. appear to marinate the pork, chop it up into tiny pieces, and sautee it. And it's usually good. Like, really good (or really, really good, as the case may be). But I learned fairly recently that this isn't how al pastor was originally done, and that's not how it's usually done in Mexico. Al Pastor originally evolved from the shwarma, a Middle Eastern favorite that involves very thin slices of marinated beef, stacked on top of one another on a vertical spit, and cooked all day, with thin pieces shaved off as needed. The technique was brought over by Lebanese immigrants to Mexico, where it was adapted for local ingredients and tastes. 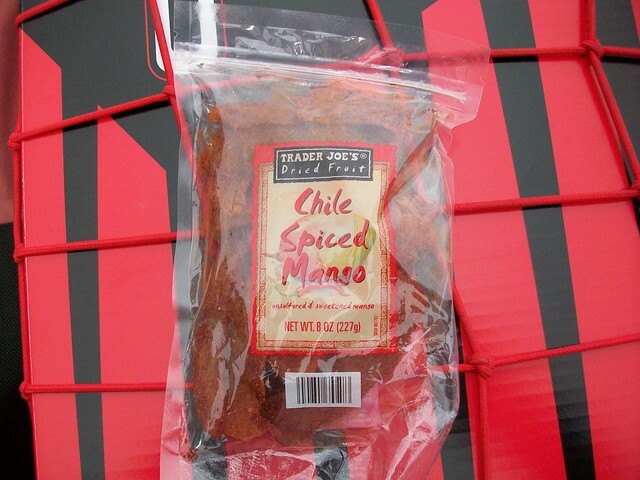 A few days ago, Becky and I bought some of these things - Trader Joe's chili spiced dried mangoes. We both thought that they were...not so great. But, not wanting to waste them, we figured they could be put to good use somehow. We began thinking about turning them into a puree to use as a marinade for meat. The discussion quickly turned to trying to make Al Pastor, and putting a slight twist on it by using mango. I decided to do my best to recreate the classic Mexican method of cooking them. Not having a giant motorized spit to roast it on, I had to improvise. Basically, I made a smaller version of the device that's normally used to make al pastor, and then cooked the whole business in the oven. The results were great. While it didn't make the absolute best pastor I've ever had, it would keep me coming back to any restaurant that served it. Cut the dried mangos into small (roughly 1/2 inch) chunks. Place them in a small bowl, and pour the sherry over them. Allow to soak for about 4 hours, until completely rehydrated. Strain and discard the sherry. With a pair of kitchen shears, cut open the dried chilies by slitting them lenghtwise, and pulling them open like a book. Remove and discard the stems, seeds, and internal membranes. Heat a heavy skillet on medium-high heat. Place the peppers in the skillet, and cook until they darken and becom aromatic, turning regularly. About 5 minutes. Place the peppers in a bowl, and pour hot water over them. Let sit for about 5 minutes, until the peppers are soft and pliable. Discard the soaking liquid. Cut the pineapple rings into manageable chunks, and place in a food processor, along with most of the liquid from the can. Add the mangos, peppers, vinegar, achiote paste, and liquid smoke. Process until pureed. Roughly chop the onion, and add it, along with the garlic cloves, to the food processor. Process for a few more seconds, until smooth. Cut the pork loin into 1/2 inch thick slices, and pound each slice with a meat mallet, until about 1/4 to 1/3 of an inch thick. Place the slices of pork into a large, resealable bag, along with enough marinade to thoroughly coat them - about 2 cups. There will be marinade leftover. Freeze it for later use. Using your bare hands, move the pork around in the marinade, to ensure that every piece is thoroughly coated. Close the bag, squeezing out as much air as possible in the process. Place the bag in a bowl or other leak-proof container, and refrigerate. Marinate for 24 hours. Take the pork out of the refrigerator. Impale a piece of pork on two wooden skewers, run the skewers through the pork until the pork is very near the opposite end of the skewers. Place the pork in the pan you'll be cooking it in, as shown. 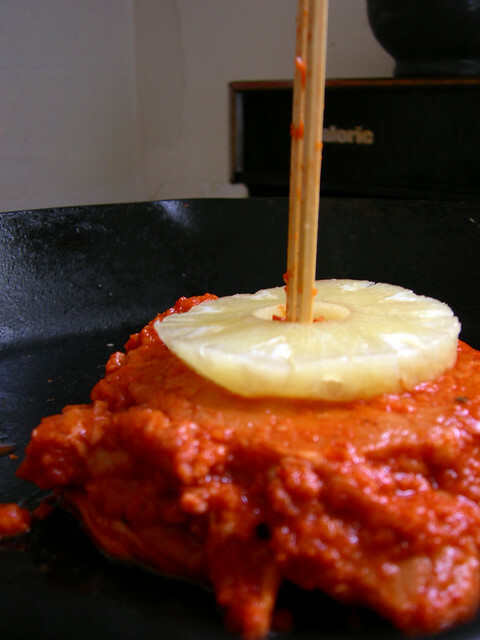 Skewer 2 or 3 more slices of pork in the same manner, and then place a pineapple ring on top of them, as shown. Add 3 or 4 more piece of pork, and then another pineapple ring. 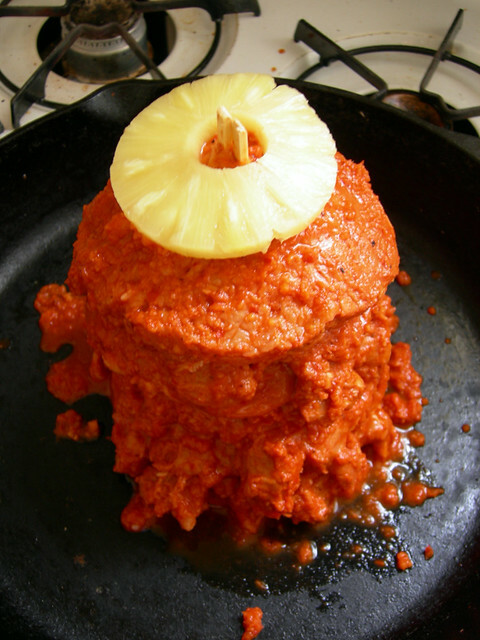 Continue in this manner (placing a pineapple ring between every 3 or 4 slices of pork), until all of the pork is used. Top with one more pineapple ring. 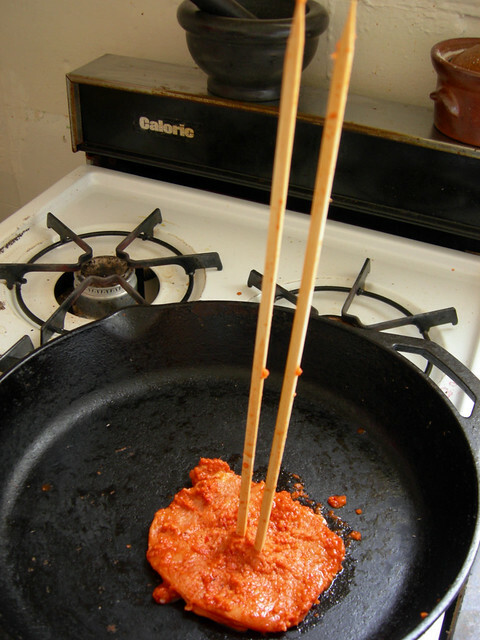 Cut off the ends of the skewers, as close to the pork as possible, so they don't burn in the oven. Heat the oven to 375° F. Place the pan in the oven, on a low rack. Cook for 45 minutes to an hour, until it reaches an internal temperature of about 160° F. If your oven cooks unevenly, like mine, you should rotate the pan a quarter turn every 10 minutes or so, to ensure that all sides cook evenly. Carefully move the pork to a cutting board. With a large knife, cut thin slices off the sides of the pastor. When all of the meat and pineapple is sliced off, form it into a pile, and chop it into smaller peices - roughly 1/2 of an inch long. Place the finely chopped meat and pineapple into a bowl, and add the sauteed onions. Toss to combine. By this point it might have gotten cold. To reheat, simply sautee the meat and onion mixture (as much as you plan on serving) in a small amount of vegetable oil, on high heat, for a minute or two. Serve on corn tortillas, topped with minced shallots, cilantro, thin radish slices, and a squeeze of lime.